(Nanowerk News) Scientists using lasers at a Science and Technology Facilities Council (STFC) facility in the UK believe that they are a step closer to finding a replacement for silicon chips that are faster and use less energy than at present. The team has tested the behaviour of bilayer graphene to discover whether or not it could be used as a semiconductor. Their results suggest that it could replace silicon transistors in electronic circuits. STFC’s Dr Emma Springate, one of the research team, with the Artemis laser. Graphene is pure carbon in the form of a very thin, almost transparent sheet, one atom thick. It is known as a ‘miracle material’ because of its remarkable strength and efficiency in conducting heat and electricity. In its current form graphene is not suitable for transistors, which are the foundation of all modern electronics. For a transistor to be technologically viable, it must be able to ‘switch off’ so that only a small electric current flows through its gate when in standby state. Graphene does not have a band gap so cannot switch off. The research team, led by Professor Philip Hofmann from Aarhus University in Denmark, used a new material – bilayer graphene – in which two layers of graphene are placed one on top of the other, leaving a small band gap to encourage the transfer of energy between layers ("Ultrafast Dynamics of Massive Dirac Fermions in Bilayer Graphene"). 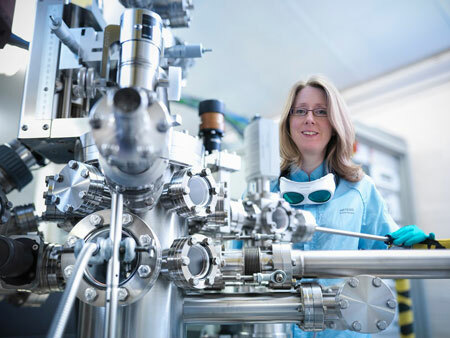 Using Artemis at STFC’s Central Laser Facility, which is based at the Rutherford Appleton Laboratory in Oxfordshire, the researchers fired ultra-short pump laser pulses at the bilayer graphene sample, boosting electrons into the conduction band. A second short, extreme ultraviolet, wavelength pulse then ejected electrons from the sample. These were collected and analysed to provide a snapshot of the energies and movement of the electrons. There can be imperfections in bilayer graphene as the layers sometimes become misaligned. The results of this research, in which the graphene showed no defects, suggest that further technological effort should be carried out to minimise imperfections. Once this is done, there is a chance that the switch-off performance of bilayer graphene can be boosted enough to challenge silicon-based devices. Graphene transistors could make smaller, faster electronic chips than are achievable with silicon. Eventually more and more transistors could be placed onto a single microchip to produce faster, more powerful processors for use in electronic equipment.